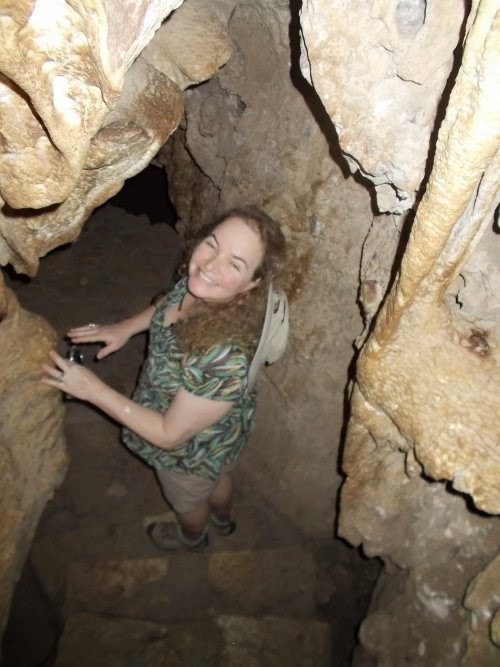 Another Long Walk: Day 11: Colossal Cave! 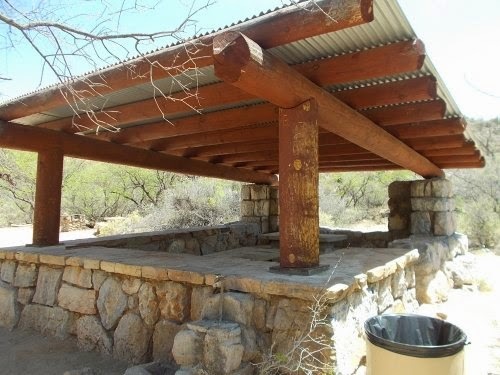 April 23: Amanda and I drove out to Colossal Cave. 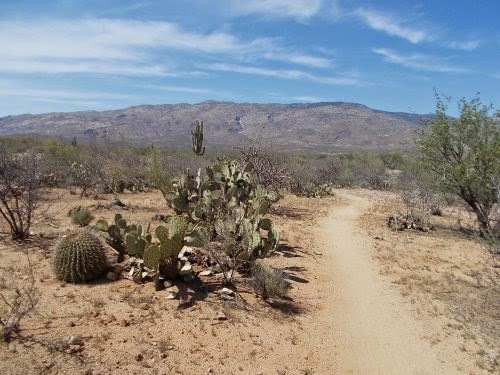 I planned to do a short section of the Arizona Trail--from where I got off the day before to the trailhead closest to Saguaro National Park that Amanda could drive to in a rental car. Saguaro NP was a bit of a problem for us since there were no trailheads Amanda could drive to anywhere in the park. There was a trailhead just south of the park boundary, and another one several miles north of the north boundary, but I'd have to hike over 25 miles between the two not to mention there was a giant mountain towering thousands of feet high between the two. I wasn't sure my body was strong enough to take that sort of abuse as a day hike. Not yet, at least. Theoretically, I could probably do it.... but what if I couldn't? What if it was too strenuous? Then I'd need my backpacking gear, but just carrying all of my gear would make my pack a lot heavier and make it all the more likely I wouldn't be able to make that distance in a day! But camping wasn't really much of an option either because camping in Saguaro NP is by permit only, and I didn't have a permit. I could have gotten one--with Amanda around, it would have been relatively easy to drive to the ranger station to get one. But it was still something of a hassle since the ranger station wasn't anywhere near the trail itself. So I hadn't decided what to do about the "Saguaro problem," but I figured at the very least, I could hike as close to the south boundary as I could where Amanda could still pick me up in a rental car. We drove up X-9 Ranch Road--a gravel road a few miles south of the south boundary that the trail crosses to scout things out. I'd walk from Colossal Cave to this road crossing if the road wasn't so bad that a rental car could navigate it. And to make sure Amanda could find the trail okay--the trail isn't always well marked for vehicles when it's not an official trailhead, and this road crossing wasn't an official trailhead. 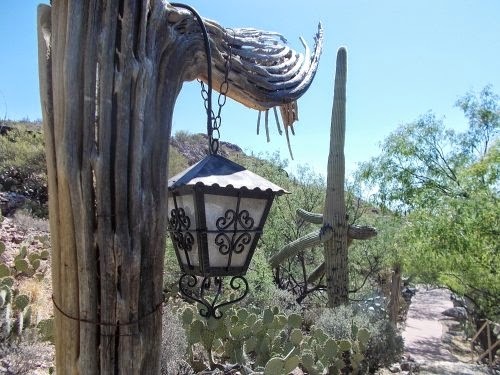 saguaro has a very strong, internal structure to support its massive size! It's a skeleton of sorts--the skeleton of a saguaro. We did, in fact, miss where the trail crossed the first time we drove by. We knew close to where it should have crossed from my topo maps, but we missed it anyhow. We turned around and picked up the trail on our way back, though. The gravel road appeared well-maintained and the rental car had no trouble with it. My 5.3-mile day hike was a go! Then we drove back to Colossal Cave. Amanda dropped me off where I had gotten off the trail, then I walked off trail about a mile to the entrance for Colossal Cave. Since we were in the area already, stopping for a tour of the cave was a no brainer. I walked from the trail to the cave, though, even though it wasn't part of the Arizona Trail for continuity when I later assembled the photos together for Walking 4 Fun. When I arrived at the cave, Amanda had already looked through the gift shop and exhibits and was just waiting for me to arrive. We paid for tickets then waited near the entrance for the tour to start in another 20 minutes. 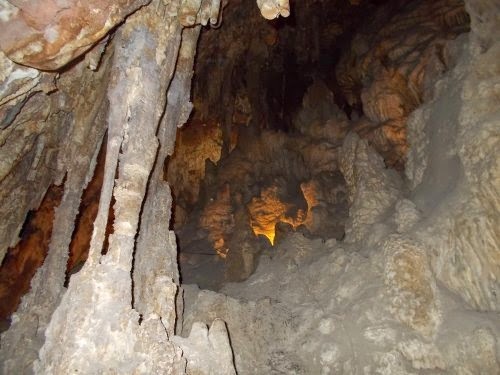 The cave is a beautiful one, and the driest cave I'd ever been in. The dank atmosphere and dripping water was nowhere to be seen. 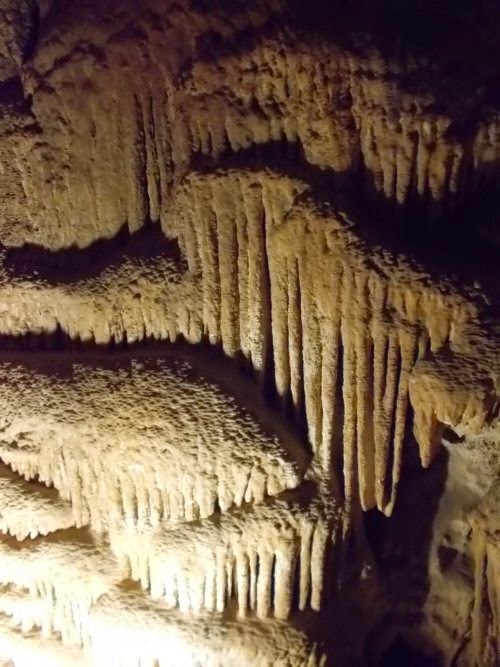 The formations in the cave weren't growing anymore since the cave was dry, but formations had formed in years past when the cave was wet. It's well worth a visit if you're ever in the area. 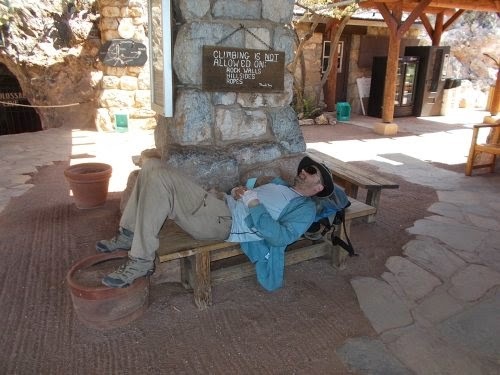 The cave was also the warmest I'd ever been in--temperatures stay at about 70 degrees year-round. (That's 21 degrees for you celsius types!) No jacket was necessary for this cave, but despite its warmth, it was still quite a bit cooler than the outside temperatures. It was going to be a warm day today! 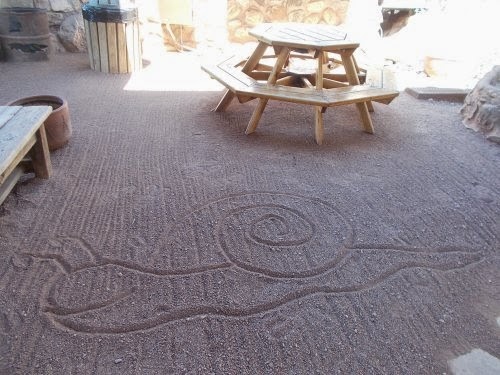 Sand art in the waiting area just in front of the cave. 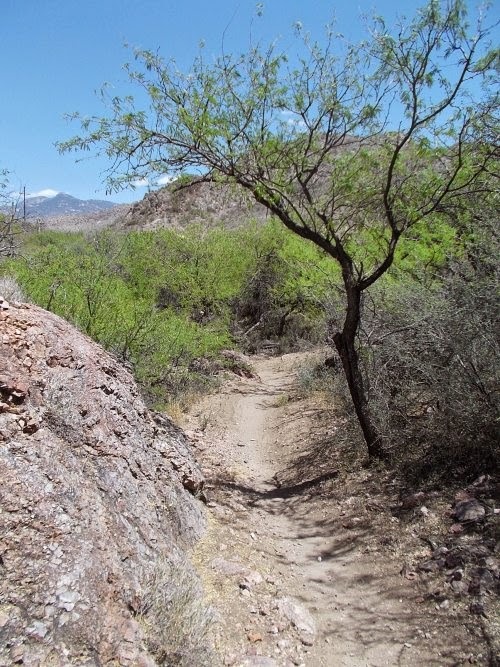 After the tour was over, it was time to continue my hike of the Arizona Trail. It wasn't even noon yet, but temperatures were soaring. It was time to knock out the miles before it got any warmer! I stopped at the La Selvilla picnic area for a quick lunch break. It had covered picnic tables and I took full advantage of them to get away from the searing sun. 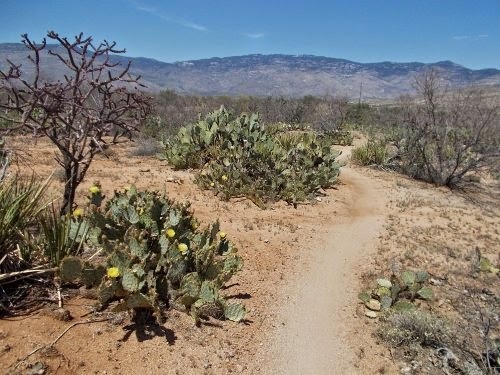 I also kept my eyes open for gila monsters--the two German mountain bikers I met a couple of days ago had seen their gila monster at this picnic area. Maybe it was still around. Lurking. Watching me eat lunch. But I never saw the gila monster and after finishing lunch, continued onward. The rest of the day's hike was uneventful and I met Amanda where the trail crossed X-9 Ranch Road a couple of hours later. I'm not sure what we did after that. My journal notes ended with Amanda picking me up from the trail. I didn't even write down that we ate lunch at Hotrods (it's just something I remembered without prompting). We might have just headed back into town where I caught up with more of my online activities and watched some TV to beat the heat of the day indoors. Amanda navigates the cave like a pro! 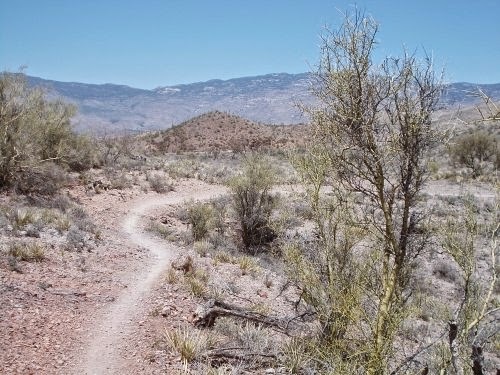 Back on the Arizona Trail! Those mountains in the distance are part of Saguaro National Park. And I'm on a collision course with them! 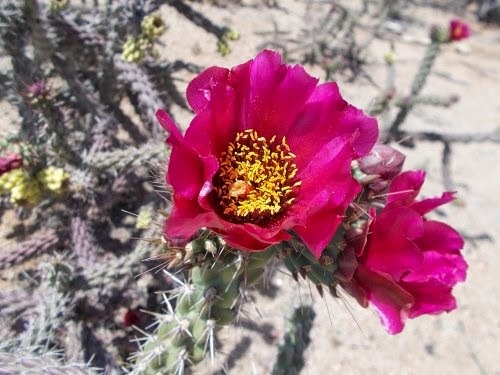 from the prickly pear cactus. 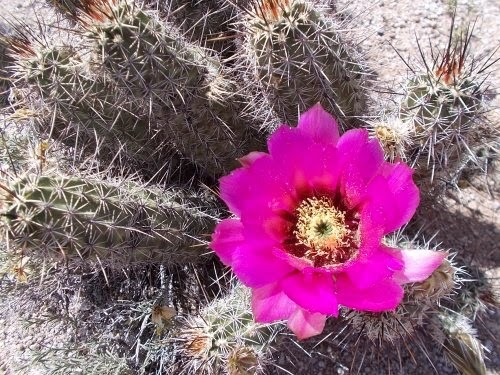 Bloom from a hedgehog cactus. 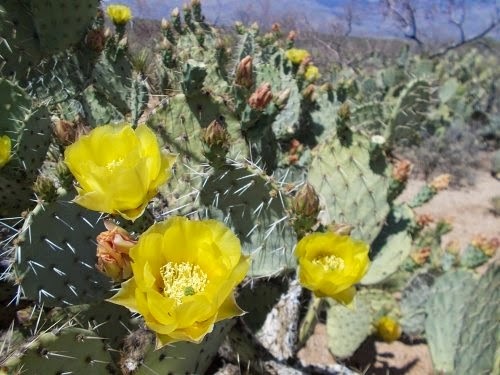 Darn, no gila sighting. 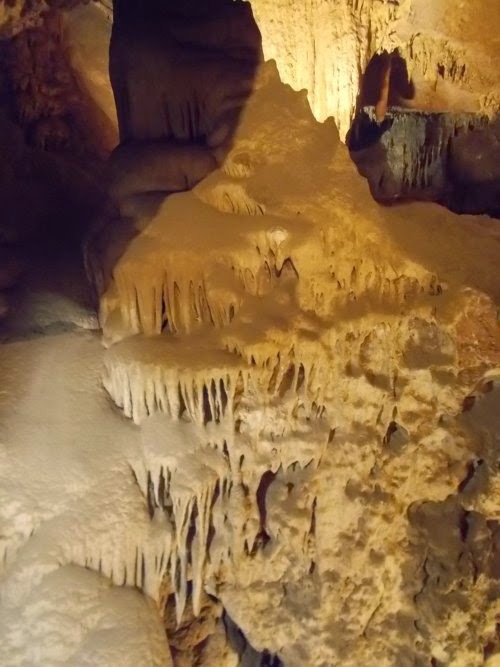 The caves pictures are wonderful! Thanks for sharing them! 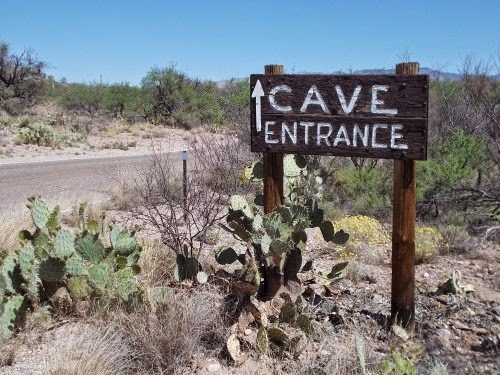 Colossal Cave is one of those places that we always say we're going to go visit, but never do. Next trip...for sure!